Whoever discovered that a simple zucchini squash could be spiralized into noodles was a genius. He/she should have been awarded a nobel prize. While I adore zucchini noodles in place of spaghetti in dishes such as pesto pasta or classic italian marinara, or even a raw bolognese sauce, my absolute favourite way to use these versatile and nutritious noodles is in the form of Raw. Vegan. Pad Thai. Infinitely fresher, lighter and more nutritious than the traditional thai noodle dish, this raw zucchini noodle pad thai retains the blissful marriages of sweet and spicy, chewy and crunchy, creamy and tangy that make takeout pad thai so dang addictive. This raw Pad Thai is much too complex in flavour and texture to be mistaken for a salad salad. 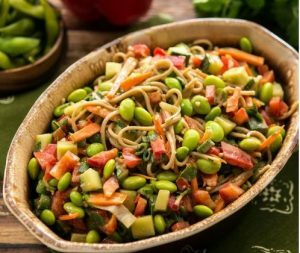 …And with a generous addition of edamame and crushed peanuts or cashews, this zucchini noodle dish is magically transformed into a nutritionally balanced main dish for a funky summery meal. And there’s always the option of topping it with some asian-inspired tofu cubes for additional protein… heaven. But what I must inform you about this fantastic recipe is that, well, I really don’t follow an exact recipe. I spiralize a TON of zucchini, as once the noodles are dressed they loose water and become smaller. Then I raid my fridge for additional veggies for a pop of colour: this time I came up with red and orange peppers, curly kale, green and purple onions, and carrots. Then I put it all into my new philips avance collection. Other great additions would be romaine lettuce or some other kind of crispy green, any kind of mushroom, and crisp bean sprouts. Then comes the satisfying crunch components: I used edamame and crushed cashews, although peanuts would’ve been a bit more authentic. Today I sauteed some asian marinated tofu and tossed it into the left over salad. If you have the time or inkling to do this extra step it is highly recommended. Except it won’t be a strictly raw pad thai anymore. But it shall still be vegan, GF, nutritious and freakin’ delicious ! Then I raid my cookbook collection and pantry to inspire the perfect thai dressing. This time I opened up Angela Liddon’s Oh She Glows and found a Asian Empowered noodle bowl recipe with two asian inspired dressing options: Thai peanut and sesame orange ginger. Ever indecisive, I combined them, adding in a couple ingredients that are also integral in classic Pad Thai sauce. While I’ve found a lot of vegan pad thai recipes that call for ketchup, I REFUSE to mar the authenticity of the dish with sugary mass marketed confections. WIth the combination of acidic lime, ripe tomato slices, and a hint of agave for sweetness, the need for ketchup is eliminated.